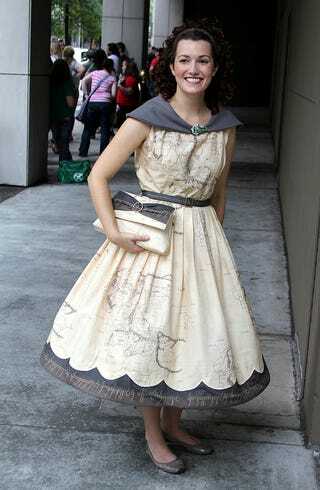 Should the wearer of this dress suddenly find herself in Middle Earth, she'll at least have a map handy. This piece of Tolkien-inspire couture was spotted at Dragon*Con 2012, and we love all the small touches: the traveling cloak collar, the Tengwar script along the belt and hem, and the matching clutch. Photo by Matt and Kristy Glasgow.